We are counting the days until the iPhone 5 is officially launched and, if analysts' estimates and previous bookings not deceive us, it appears that the success of the iPhone 5 launch will dwarf any other product consumer electronics in 2012. As part of the preparations for the day "D", the company has provided its distributors learning materials in order to ensure that sales representatives are ready on launch day. IDB has got a pair of these documents. They include eight key messages that have commercial use: is the thinnest and lightest iPhone Retina display, 4-inch display, wireless flash, A6 chip, 8 megapixel iSight camera on the back, totally new EarPods improved audio, dock connector Lightning again and, of course, iOS 6 and iCloud. Apple is advising its sales representatives to highlight the new design of the iPhone 5 (the " Rolex of smartphones ") and four-inch 16:9 aspect ratio, plus the new feature panoramic photos and other features of iOS 6 as Safari improvements, implementation and the new maps Passbook Apple. You can see both documents in high resolution here and here . Let the customer keep the iPhone 5 in hand to experience the thin and light it is and how easy it is to use it with one hand. Highlight details like brushed aluminum casing, beveled edges and Lightning connector. Touch the camera icon, then Options and Panorama. Capture a photo moving slowly through a landscape scene. Tap the Photos app to show examples of panoramic photos. Flyover: In Maps, enter "Transamerica Pyramid, SF" in the lower right corner select satellite mode. Zoom In and drag with two fingers to see another point of view. Passbook: Passbook Touch icon. Move through the different options and windows and stop to display a ball. Safari: In Safari, go to a local news site to show how much more you can see the page on the new screen. Turn the iPhone 5 horizontally and tap the arrow button at the bottom right to view full screen. When it comes to showing iOS 6 and iCloud, Apple's strengths are Maps, integration with Facebook, Siri improvements, new features of shared photos, Passbook, FaceTime on mobile network and new applications for Phone, Mail and accessibility options. 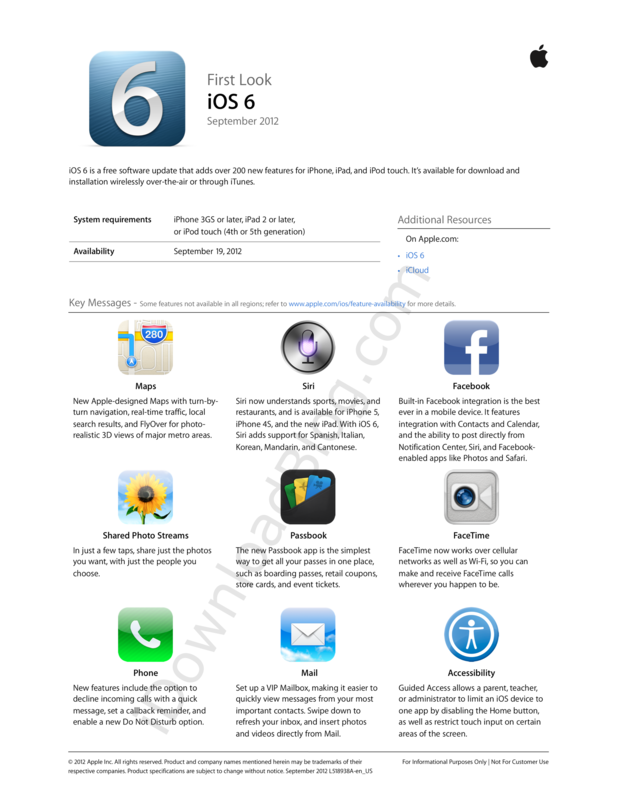 Of course, these are just the key new features as iOS 6 has over 200 new features and enhancements. 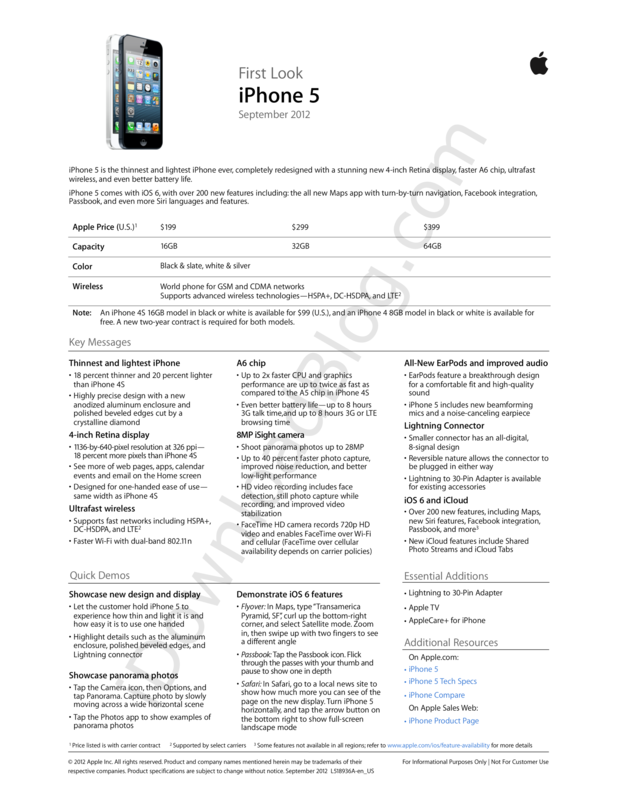 In the Apple documentation offer a nice view of the haves and the capabilities that define the iPhone 5, but vendors also will need to consider carefully how to show the advantages of the Apple team over its competitors. We will see also that arguments used Android mobile vendors to try to convince buyers that their phones are better than the iPhone 5. What do you think? Do you want to receive your iPhone 5?